Celebrate the growing season with this mixed metal coneflower pendant necklace. 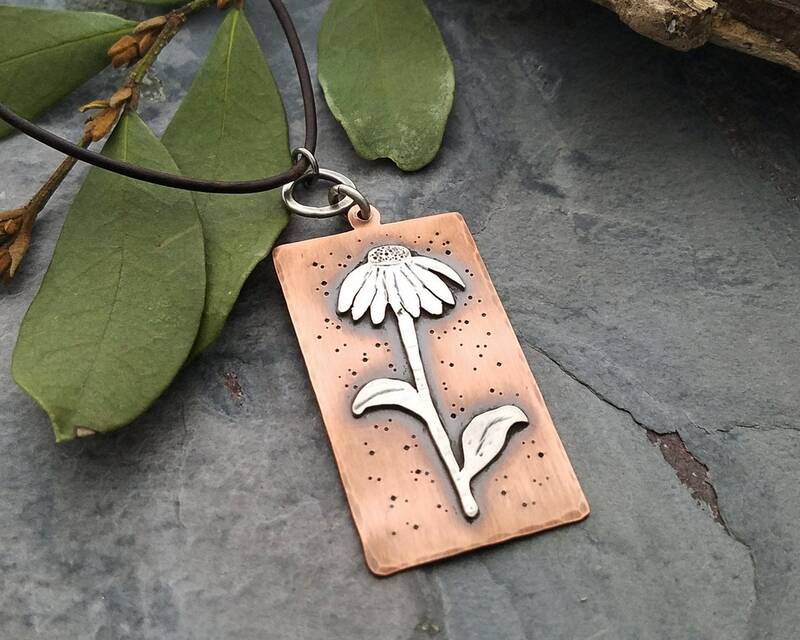 The coneflower shape was hand sawn from sterling silver and textured. It has been soldered to a rectangle copper backing. The pendant suspends from an organically formed sterling silver ring. The pendant hangs on a brown or black leather cord in the length of your choice. It fastens with a lobster clasp. The rectangle (without ring) measures 1-5/8" long by 1" wide. The total length of the pendant with the silver ring is 2-1/8". The pendant has been oxidized, tumble polished and sealed with a protective coating.